If you want to give the beloved kitty on your list something truly special, there are a number of upscale cat gifts to choose from. Select a special collar, carrier, or even an outfit to give your kitty a little extra pampering. What Are Upscale Cat Gifts? Upscale cat gifts are the luxury counterparts of normal pet items. They are typically sold at pet boutiques either in-store or online. You will not likely find upscale pet items at your average pet stores such as Petco and Petsmart. Even massive Pet-marts sell expensive items, but upscale cat products are much more than just pricier versions of ordinary items. They carry with them an elite status. Luxury pet supplies boast both limited distribution and adequately high prices to match their quality. When you're combing around the web for luxury pet products, it won't take heavy scrutiny to notice the difference between humdrum pet items and their upscale counterparts. For example, the average cat collar features a non-snag nylon band that comes in a few classic color combinations. It typically sells for less than ten dollars. Sometimes these collars come with special features that are almost always more functional than they are attractive. However, this is not so with luxury pet collars. Functional styles won't cut it in the world of competitive and celebrity pets. An upscale cat collar comes in soft supple Italian leather and is coated in Swarovski crystals. Colors are vivid, shocking and deliciously posh, and price tags reflect these features. The average upscale collar will exceed thirty dollars and can easily reach the hundred dollar mark. The world of upscale pet gifts combines elements of the functional with the fabulous in order to create items that are fantastically unforgettable. Some cat owners enjoy throwing birthday parties for their precious felines, and this necessitates equally precious gifts from attendees. If you can't afford an alabaster and jewel-laden pet bowl, there are smaller, less expensive products that can be considered both luxurious and affordable. Kitty nail polish is just one of many adorable gifts that offer the opportunity for fun indulgence. Cat booties and sweatshirts are another sweet idea. In the past, luxury items have been more readily available for small dogs than cats. This is because small dogs are more frequently dressed than cats. However, there is no reason why your cat cannot wear the dresses, sweatshirts, collars and booties that are often designed for petite pooches. A cat may take a while to adjust to his new wardrobe, but there is no doubt that felines look every bit as adorable as a Terrier when dressed in a sweater. Some cats actually have no objection to being dressed and will resist fraying and tearing at the cloth. This represents the ideal case, and it happens more often than you may suspect. When shopping for kitty clothing as a gift for a friend, don't be afraid to shop the posh pooch lines as well as the cat items. These clothing products are almost always interchangeable between species. Pampered Pets represents the more extreme aspects of posh. Here you can find kitty loungers that feature divine craftsmanship in the sort of furnishings worthy of royalty. Cat collars are exceeded by actual pet jewelry, not to mention the vast array of pet grooming supplies such as paw polish and pet cologne. 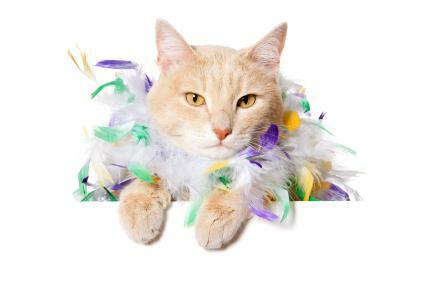 Posh Pet Glamour Boutique caters to canines, but this can also be a great place to shop for kitty clothes. Again, clothing items are often interchangeable, and what feline doesn't need a bathrobe? Remember, luxury cats do not bathe themselves. In fact, they shouldn't do anything themselves, and there's no apparel better suited for a day of being pampered and adored than a bathrobe. Fortunately, PoshPets has an entire store category set aside for pet bathrobe, and you'll even find wigs at this site! If you're looking to make in-store purchases, some pet items can be obtained from upscale companies like JuicyCouture.com and department stores such as Saks and Neiman Marcus. You will also want to hunt around your city for elegant pet boutiques in order to widen your horizons.